Where do funds for our schools come from? Charlotte-Mecklenburg Schools is the second-largest school district in North Carolina and the 18th-largest in the U.S. It is also one of the largest employers in Mecklenburg County, with more than 19,000 full- and part-time employees. County - County revenues come from several different sources, including property taxes on homes and businesses, county sales taxes and fees. State - Each year, the North Carolina General Assembly approves the state budget. Money for education is allocated to North Carolina’s Department of Public Instruction, which divides funds among the 115 school districts in the state and charter schools. Individual district allocations are based on the number of students and their special needs, family-income levels and other factors. Most state funding must be used for specific purposes or programs determined by the state. 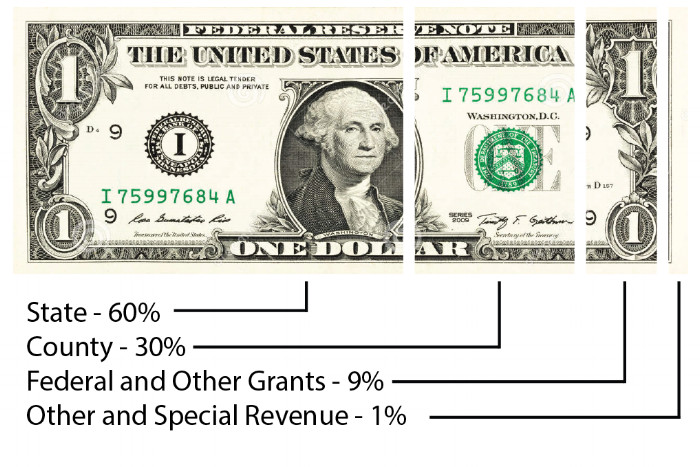 Federal - Almost all federal funds are directed to specific programs. Some federal funds, such as Title I, are allocated based on the CMS student population. In other cases, the school district must submit competitive grant applications. The total budget for the district is actually two separate budgets – an operating budget and a capital budget. The two budgets are equally important but they are separately funded. More than 80 percent of the operating budget is used for salaries and benefits. About 80 percent of CMS employees work in schools. Of the school-based employees, about 55 percent are teachers. Principals, guidance counselors, media specialists, teacher assistants, cafeteria workers and other support staff make up the rest of school-based employees. The capital budget is similar to the structural costs of a home, such as necessary renovations or improvements. It pays for the design and construction of new schools, expansion of existing schools and major renovation and replacement of older facilities to meet education and safety standards. The capital budget is primarily funded through bonds approved by voters and issued by the county. that matter most to our students.